It’s no secret that I love meal plans. If I wasn’t committed to meal planning feeding my family a healthy diet would be a lot more expensive. In fact, having a meal plan is one of the ways I’m able to eat a real food diet on a budget. Over the years I’ve meal planned in different ways and used different meal planners to fit my needs. My needs have varied in different seasons of my life. Real Plans has been a great fit for me for many reasons. I’m excited to share the ten things I love most about Real Plans. But first, let’s talk about whether or not Real Plans is worth it for you. I’ve tested a lot of meal planners and found that Real Plans is the Cadillac of meal planners. It’s got all the bells and whistles. Is a honest-to-goodness real food diet important to you? Do you want to know for certain that the recipes you’re cooking are healthy? Do you follow one of these real food diets and need a personalized meal plan that adheres your dietary restrictions and inclusions: Paleo, Whole30, AIP, Keto, Classic/Traditional Real Food, Real Food Vegetarian, GAPS, Real Food Diary Free, or Real Food Gluten Free? Do you hate coming up with new ideas for breakfast, lunch, and dinner? Do you want an app that makes meal planning super convenient? Do you want your meal planner to make your grocery list for you? Do you want the ability to easily change the serving sizes of your recipes to fit your family size? Do you want a prep timeline that helps you remember, for example, to thaw meat or do to other meal prep? When I started using Real Plans I was in a really busy season of life. I’d been using my own printable meal planners to plan my meals, but I was looking for ways to meal plan quickly. I was overwhelmed with the task of coming up with healthy meals for my family every night of the week. I wanted a meal planner that would fill in the recipes for me so I didn’t have to spend precious time searching the internet and my cookbooks for recipes. 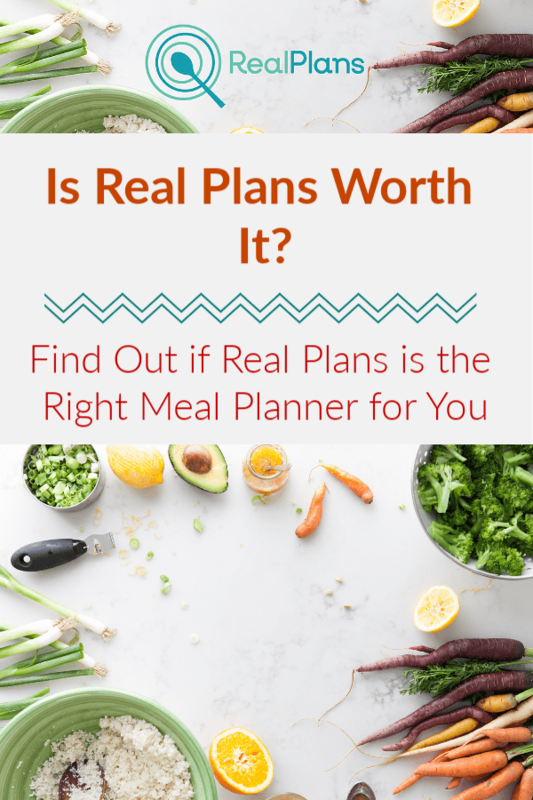 Real Plans is perfect for the busy, real foodie who wants to get organized and save money but who doesn’t have time to create a meal plan from scratch. Real Plans is like a personal assistant for meal plans. Read below to find out the ten things I love most about Real Plans. Real Plans is the perfect meal planner for healthy families. Here are ten reasons why I love Real Plans. When I was new to a real food diet I wanted to be sure that the recipes I made were actually healthy. I wasn’t confident in my ability to take an unhealthy recipe and make it healthy on my own. For example, when a recipe my family loved called for a can of cream of mushroom soup I didn’t know how to make that myself with healthy ingredients. I love that Real Plans takes the guess work out of planning a real food diet. You can rest assured that the recipes in Real Plans are all healthy. Even though I’ve listed it second this may be my favorite feature of Real Plans. See, there’s not just one way to eat a healthy, real food diet. Real Plans knows that there are many real food diets to choose from. When you start a new way of eating you don’t always know which foods are acceptable on your diet and which aren’t. Real Plans knows and will only plan recipes for you that fit your dietary needs and restrictions. If you don’t want gluten or dairy in your diet, Real Plans has you covered. No need to worry about too many carbs if you’re on Keto. No sweat over butter vs. ghee if you’re on Whole30. You know what I hate doing? I hate printing out recipes or dragging my laptop to the kitchen to follow a recipe or hunting down a recipe in my phone’s browser. You know what I love? Having an app on my phone that lets me pull up my meal plans and my recipes anywhere, anytime. I love that Real Plans makes it possible to meal plan while waiting in line or while waiting for soccer practice to end. Sure, you can create your own meal planner. But doing so requires you to gather the recipes yourself, write them down or type them up, and make your own shopping list. Real Plans is more than just a meal planner. Real Plans are full service meal plans designed to save you time and money. Speaking of saving money . . . Real Plans is incredibly affordable. Getting organized and cooking meals at home will save you way more than the cost of the meal plans. When you create your own meal plans you have to comb through each recipe for the ingredients to add to your shopping list. Real Plans makes your shopping list for you. You can even add items to your shopping list, such as toilet paper or pet food. And Real Plans organizes your list by grocery store section to make shopping so much easier. What happens when you’ve planned a meal and your plans change? What about when you decide you want Wednesday’s dinner on Friday instead? Real Plans makes it easy to move your meal plans to another day or delete a meal if needed. Say you want to increase the serving size of a recipe from 4 to 6. Real Plans lets you do that easily. Want to use ghee where butter is called for? Real Plans can accommodate that, too. This a newer feature of Real Plans that I think is just genius. If you’re new to meal planning and feeling lost with all the amazing features available on Real Plans, just hop on live chat for their excellent customer service. Have you ever forgotten to thaw meat for dinner? Yeah. Me, too. It’s not uncommon for a busy cook to forget important meal prep steps that happen outside of normal meal prep time. Real Plans saves you from this common busy-life oopsie by offering a Timeline feature for easy prep. Timeline tells you when to do the prep steps from your recipes so that you’re not stuck at the last minute with frozen meat, for example. You can also customize the Timeline so you can, for instance, thaw meat or do other meal prep the night before instead of the morning of if that works better for you. Overall, Real Plans is worth it for the real food cook who is short on time. I’ve enjoyed the many features Real Plans offers for a low price. I think you will, too.